NJZ Lighting designed and invented the Defender, Ranger and Warrior series of explosion proof lights in 2016. It soon won worldwide approval from customers due to the high quality of product and our excellent customer service. 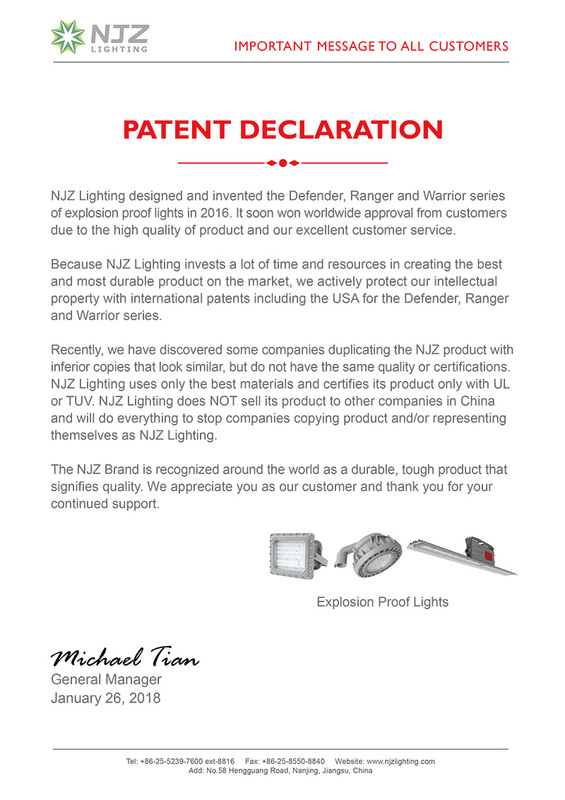 Because NJZ Lighting invests a lot of time and resources in creating the best and most durable product on the market, we actively protect our intellectual property with international patents including the USA for the Defender, Ranger and Warrior series. Recently, we have discovered some companies duplicating the NJZ product with inferior copies that look similar, but do not have the same quality or certifications. NJZ Lighting uses only the best materials and certifies its product only with UL or TUV. NJZ Lighting does NOT sell its product to other companies in China and will do everything to stop companies copying product and/or representing themselves as NJZ Lighting. The NJZ Brand is recognized around the world as a durable, tough product that signifies quality. We appreciate you as our customer and thank you for your continued support.